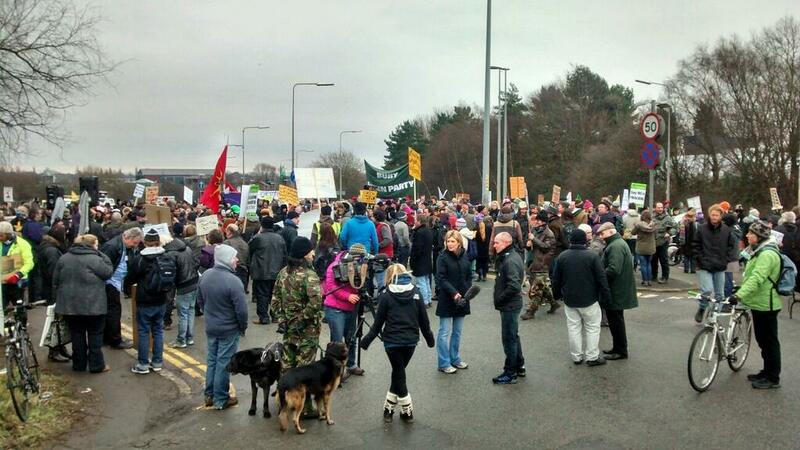 On Sunday 12 January 2014, around 800 people joined in solidarity with the Barton Moss Camp on a peaceful march from Salford Reds Stadium to the IGas Drilling site, despite the BBC reporting only 250! Thanks for this article in the Salford Star. 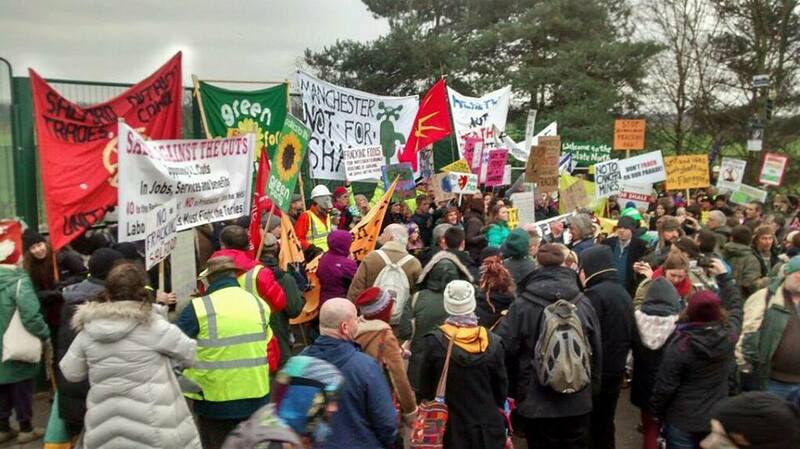 Over eight hundred people marched from Salford City Stadium to the Barton Moss Community Protection Camp this afternoon as part of a Solidarity Day with the anti-fracking campaign in Salford. All afternoon local people in passing cars tooted their horns in support of the protest, while a Salford City UNISON speaker derided the national press over its coverage of the Camp. “I want to address this myth that’s been propagated in the media, that this opposition is something that has been thrust on the people of Salford from elsewhere” he said “I’ve lived in this city all my life, I’m proud to represent people who work for Salford Council and we are 100% behind what’s going on here in terms of this resistance, absolutely 100%. “You have our absolute solidarity and I’m looking forward to standing with people on Wednesday morning outside Salford Civic centre” he added, referring to the protest planned by anti-fracking campaigners and Salford City UNISON members outside Salford Civic Centre*. “Every day we come across victims of the pollution and the corruption that comes from the way that the oil and petrochemical industry has dominated the whole world” she said “We see the victims of it. People in Salford who die 18 years younger than they would if they lived in Kensington and Chelsea because of the pollution that we put up with every day of our lives. Alongside UNISON, the University of Salford was represented by their UCU branch, Salford District Trades Council was also present, as was Salford Against The Cuts, while many local people who made their own anti-fracking placards. There were also representatives from an array of environmental groups, from the Green Party to the Campaign Against Climate Change, and from anti-fracking groups from as far away as South Wales. Messages of support were also read out from people campaigning against fracking all over Europe – from Romania to Holland. And, locally, the message came loud and clear from passing motorists on Liverpool Road that they support the campaign, with constantly tooting horns and people opening their car windows to put their thumbs up and applaud anti-frackers who lined both sides of the road. After the rally, there was a march past the Barton Moss Camp and up to the gates of the IGas exploratory drilling site, where Darren Nesbit once again entertained the crowd with songs, including what has become the Camp anthem `We Are The 99%’. Today’s march and rally came in the wake of news that Total, the French oil company, is about to invest in fracking ventures in the UK (fracking is banned in France), and the day before an expected Government announcement that fracking companies are to get business rate relief on their activities. Wednesday 15th January between 8am and 9:15am outside the Civic Centre on Chorley Road, Swinton, prior to a meeting of the Full Council. • A protest against Salford Mayor Ian Stewart’s appointment of the £150,000 Fat Cat Head of Paid Service. Incorrect date given above – the mass mobilisation was 12 Jan not 9 Jan. When is there? / Is there already? a newsletter or briefing?